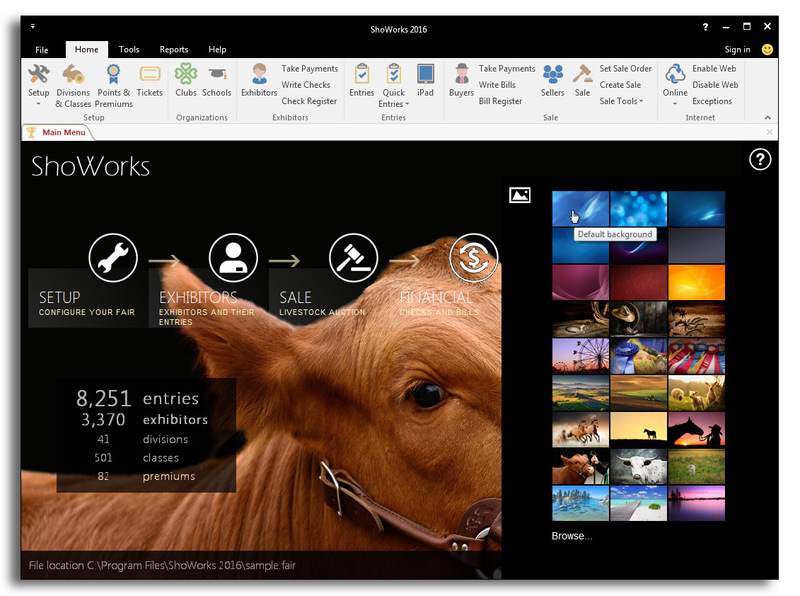 What's New in ShoWorks 2016! Click here for the minimum requirements of ShoWorks 2016. Click here for a 4-page write-up article on ShoWorks 2016. 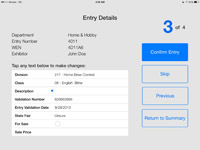 Create entries and check-in with any mobile device or web browser at a kiosk, print entry tags, back tags, or receipt (more coming soon!). 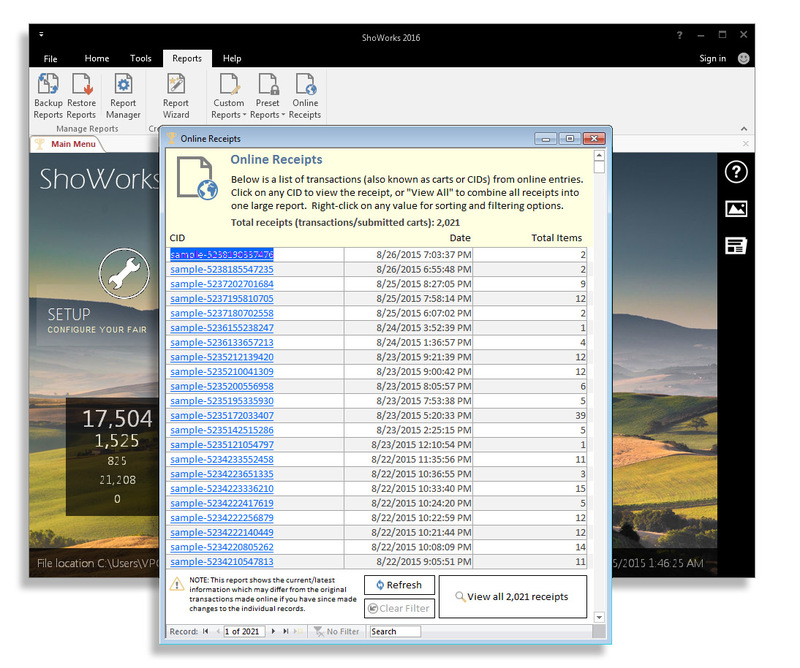 We have taken the previous version of ShoWorks and expanded the compatibility, not taken away, allowing this time a deeper compatibility coverage than ever before (past three versions of Microsoft Office and Microsoft Windows including the newest releases of both Windows 10 and Office 2016). The number of themes has almost tripped, allowing beautiful homescreen and interface appearance including the ability to build your own theme using your photos. New fields added like Electronic ID, Premise ID, and UAID (Universal Animal ID) have been added, allowing identification based on global standards and easy scanning with a compatible RFID Bluetooth reader (wand) which pairs with the ShoWorks iPad app as well as the LivestockTags.com iPhone reader. 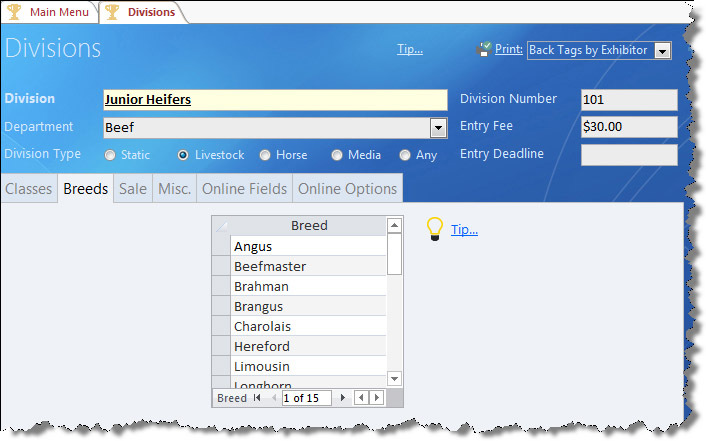 Breeds can now be preloaded and stored and managed across multiple divisions, allow drop-down selection at data entry both locally, online, and on the iPad. 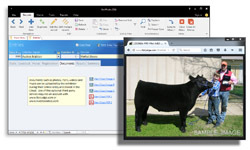 ShoWorks now connects live to FairJudge allowing you to view digital photos that exhibitors have uploaded as well as livestock health papers uploaded to LivestockDocs. 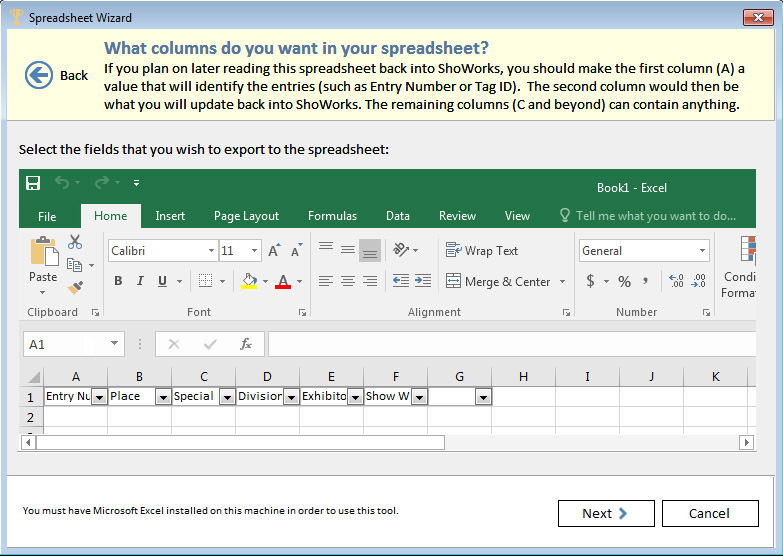 The spreadsheet wizard now allows for multiple columns importing at the same time (formerly just one column). You can now mark batches of entry tags for printing, which automatically resets the marks upon printing, allowing staff to easily one-click the latest batch of entry tags without cumbersome filtering. 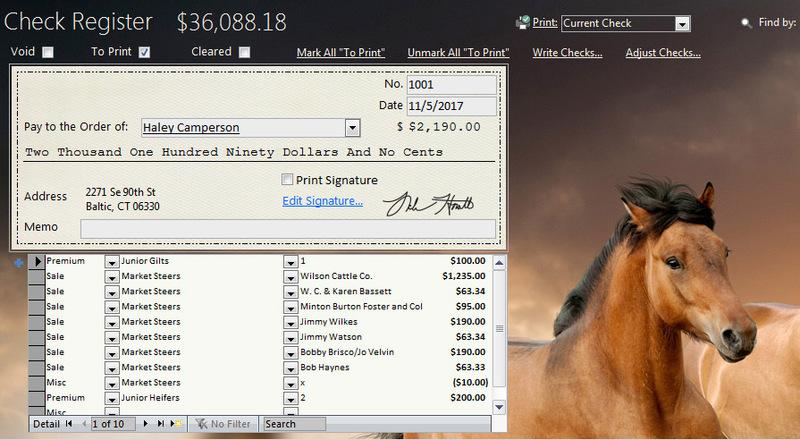 The former “publish results” has been enhanced not only to an aesthetically beautiful layout for the public, but now includes options to publish sale/auction results in addition to regular judging results all to Facebook, Twitter, Saffire and your own website. Reduce the number of tags per exhibitor by consolidating them by class, division or department, Also, large QR Codes print (optional) on the back tags, allowing for quick scans as they enter/exit the ring. Easily insert check signature(s) for your checks to avoid hand signing hundreds if not thousands of premium and auction checks. A new report was added that comprehensively looks at all premium calculations (both straight and sliding) to provide you with an accurate estimation of potential premium payouts. A new utility searches for possible duplicate classes in your division structure. 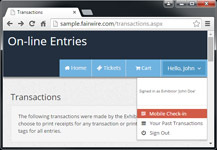 Users can now let ShoWorks automatically adjust exhibitor checks based on over or under payments made by the exhibitor, whether the exhibitor owes the fair or fair owes the exhibitor. Specify a goal $ amount for the sale and buyers can add this amount to their auction purchases. Add or take away $ amounts from buyer bills based on how much they owe from their auction purchases. We have added new scenarios and conditions to look for where ShoWorks will find human “mistakes” that were made upon entry (like typing in $ amounts that are too large or small based on past trends and averages), preventing checks and bills from being incorrect. Similar to the Exhibitor and Club Activity report, the Department and Division Activity report shows all financial transactions related to each department including both entry fees and exhibitor fees like gate passes, etc. Many of the fields that had too small of character limit (such as “status”, user defined text and lists, division sponsors, etc. 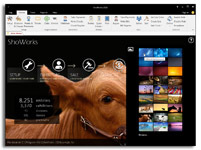 were increased to their maximum physical allowed length by Microsoft, allowing the fair to store more information. In addition to the existing “Proper Case” action, a new “UPPERCASE” option has been added to the right-click menu which changes data to the desired case. The dependency on Microsoft’s “mscomctl.ocx” was finally removed, which was a headache forcing some to frequently re-run an update patch for restoring the startup of ShoWorks. Scan RFID (Electronic ID) livestock tags using a Bluetooth EID reader (by Allflex), easily locating entries for judging, check-in and check-out. Move entries to different divisions or classes (optional). Allows scanning of entries upon their exit which records date/time and the device/person that scanned them. Kiosk workflow has been totally redesigned, allowing for a much smoother and faster exhibitor check-in. Kiosk now allows “required” fields, allowing you to force exhibitors to complete additional data at check-in. An option has also been added to prevent exhibitors from changing data once they have confirmed an entry at check-in. Stay on top of what your exhibitors say about your fair experience. 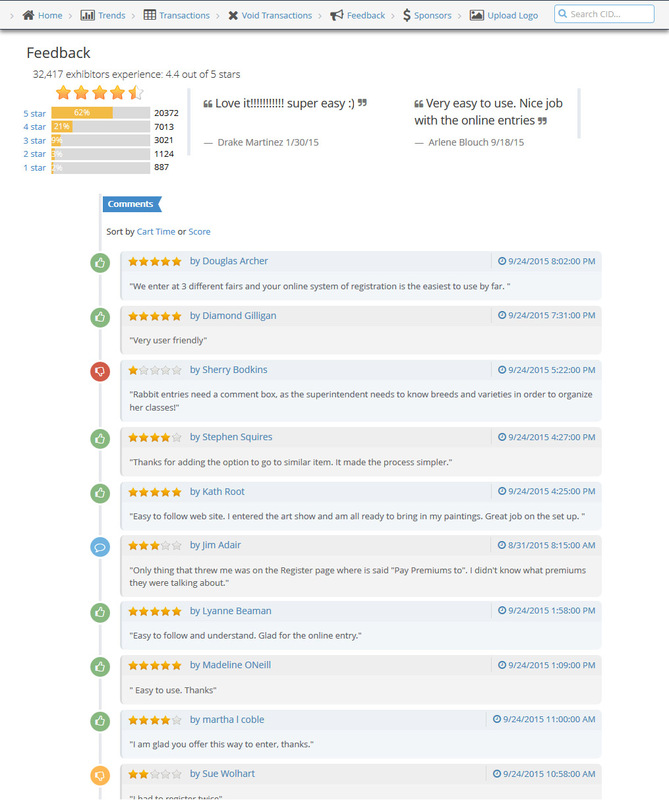 Similar to Amazon ratings (5 star with comments). 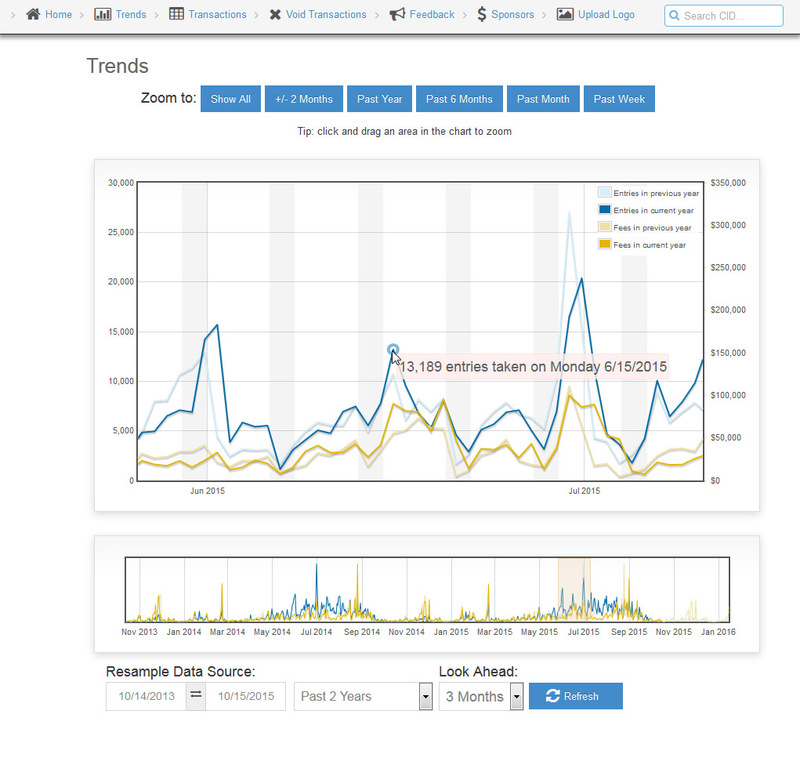 Monitor your online activity with graphs showing the trends of this year’s activity compared to last year. A new platform independent re-written website gives a fresh new look to a stable familiar standard that adapts to whatever device the visitor has, whether web browser, tablet or smart phone. The public is used to and has come to expect to be able to check-in with their mobile devices. If you are using the iPad kiosks for self-check-in, exhibitors can pull up their QR Code online and hold their phone in front of the kiosk to recognize them and being the check-in process. Let exhibitors duplicate/copy entries into other divisions and classes. Limit the number of total online entries on a division-wide or class-wide basis. 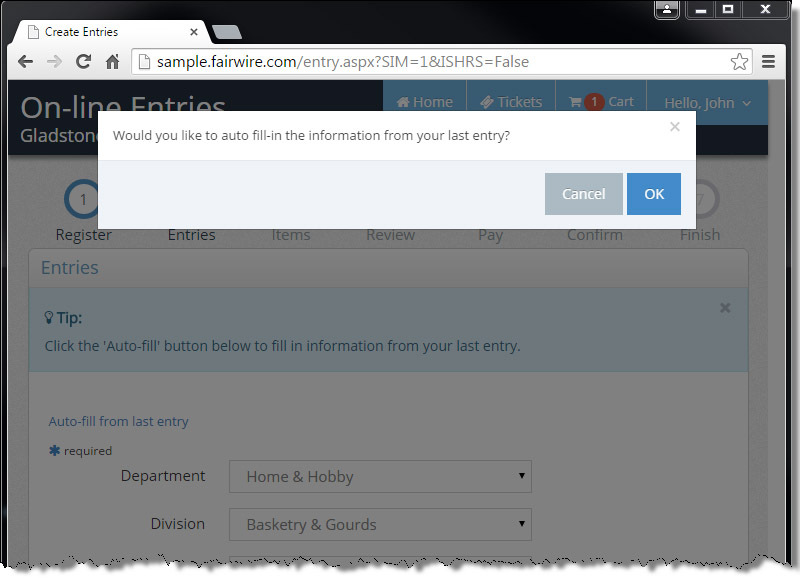 Also limit the number of entries any single exhibitor can make either in a division or class. We found that many people would print individual online receipts. Now this can be done locally, allowing quick access to printing entire batches of online receipts. Prior to uploading and going live online, ShoWorks reminds you if any divisions have illogical entry deadlines (greater than 6 months expired), preventing embarrassing hassle of your online exhibitor experience. 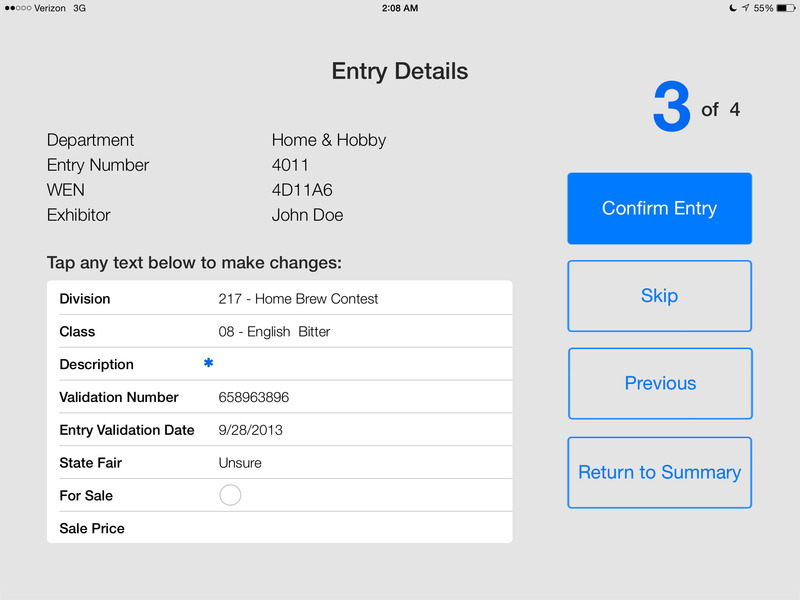 Judge or check-in your entries on an iPad tablet. Self-check-in for your exhibitors via kiosk (using an iPad mounted in stands). Print QR Codes (barcodes) on entry tags for quick scanning (using an iPad as the scanner). 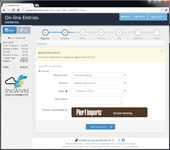 Publish results directly to Facebook, Twitter, Saffire , or your own website within 3 clicks. Set class limits for exhibitors. Many new preset reports including payment discrepancy, back tags, buyer cards, coop cards, etc. New wizard to update divisions and classes all at once with our most powerful wizard to-date. Update any field in all or selected departments, divisions or classes at once. (examples: Entry deadline, entry fees, premiums, sale info, online configurations, etc. Find and “bump” any date values by one year. Sort and renumber all or selected departments, divisions or classes at once. Copy classes from one division into many other divisions at once. New wizard to adjust checks for flat amounts, %’s, and deductions for owed entry fees. New wizard to adjust bills for flat amounts, and %’s. New wizard to adjust sale for flat amounts, % of sales, % of add-ons, % of unit price, and per pound. 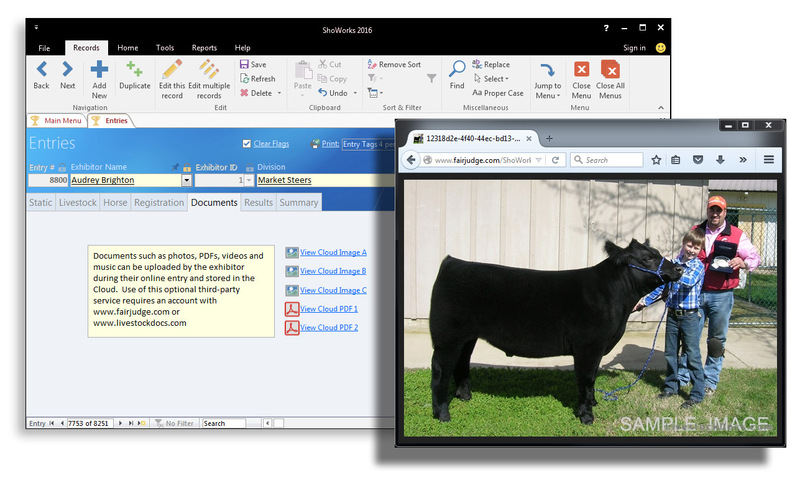 Display Tag ID and easy-to-read ownership in bills, invoices, and sale reports. Find records in menus using drop-down from the field of your choice. 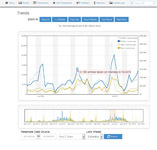 Print content sensitive reports (both preset and custom) directly within menus. 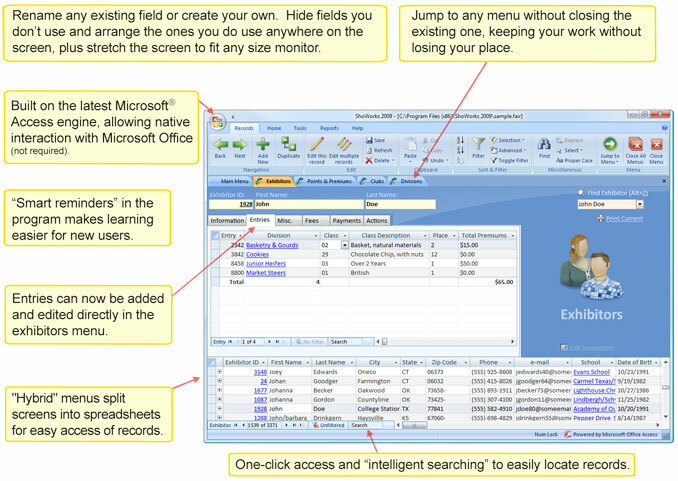 Create Microsoft Excel spreadsheets in one click from both the report wizard and quick entries. 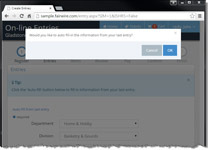 Improved online entry data uploading during high traffic times. Sell general admission tickets online and configure directly in ShoWorks. Personalize your ShoWorks with 12 beautiful themes. Allow clubs and schools to login and approve entries. Online Media - Upload photos, videos, music and PDFs for entries. Online Media - Judge, score, and comment on entries online, anywhere, anytime. Online Media - E-blast entry tags and online judging results. Online Media - Display top placed photo entries via slideshow on your own website or monitors. Scalable interface to take advantage of larger, more popular monitors (yet still work on most smaller ones). Minimum display size is now 1024x768 (as opposed to the former 800x600). Basically, the larger screen size you have, the more ShoWorks will adapt. We mean the ability to rename fields on your menus (don't like the term "Class", no problem, rename it to "Lot" with ease). We mean the ability to fully customize your own menus (add, remove, re-arrange the form with the fields you want - no more padlocks). 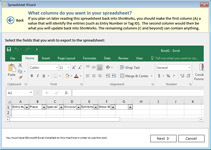 We mean dragging, resizing, and arranging columns in spreadsheet view and ShoWorks remembering your arrangement. Hybrid menus - that show the traditional menu with fields (one record per screen) plus a spreadsheet type view on the bottom of the menu that has all records as a list for fast/easy management. Very nice - one of our favorite features! Active menus (move among menus and keep your place). For example, you may be working on a particular record in the Divisions menu, then need to flip to the Exhibitors menu. When you go back to the Divisions menu, your cursor on the same record is right where you left it to pick up where you left off. Intelligent searching. Now, a generic search box where as you type, ShoWorks narrows down the records on "every" field. For example, start typing "Cal" and ShoWorks narrows records down to those including Calvin as a first name, Calhoun as a last name, Calgary as a city, Callamazoo High School as a school... Just keep typing and the more you type, the narrower the results get. Type in 307 and records are narrowed down with 307 as an Entry Number, 307 as an Exhibitor Number, 307 as an area code...and you get the idea. Lots of User Defined fields (71 new fields to be exact). New "import and merge latest changes" wizard, updating, merging and importing records from another ShoWorks data file without needing a network. Automated offsite backups to protect your data from any disaster. Report grouping (organize your custom reports by dragging and dropping into groups). Three times as many preset reports as prior versions, including refinements in existing preset reports. Click here for a 33-page sample of preset reports (PDF). True Sliding Scale Premium Scheduling. This will save lots of time on premium management. The former method of points and premiums is still available and can be used cooperatively with the new method. Flexible sale commissions to exclude add-ons. Paperless buyer billing and payments (e-blast their bills and they click a link to pay online with a check or credit card). Create multiple entries (multi-class) for those exhibitors with many entries all in one click. Flexible fees to charge by exhibitor or by entry. Online buyer payments if you also have an auction. Gather valuable feedback from your exhibitors with a customizable survey at checkout. Customize the entire site exactly to your fair’s needs with “skins” that match your fair theme. And almost 1,000 other enhancements and tweaks based on years of feedback from hundreds of fairs across North America.